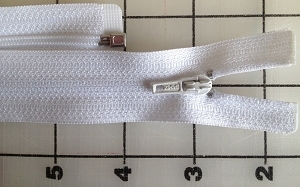 #3 Coil 1-way Separating Zipper with REVERSE Pull. This is an ALMOST invisible zipper. That means that the pull is put on the REVERSE side of the zipper so with careful sewing the zipper looks almost invisible. This technique is stronger than an invisible zipper of the same size. Some manufacturers call these invisible identical. I have REAL invisible zippers on my site that are separating. Invisible zippers are built differently than a standard #3 zipper. Light weight zipper for use in dresses, choir robes or bath robes. These work best for small fingers. If you are replacing a choir robe zipper for a man, I would recommend a larger pull & possibly a 2-way separating so that sitting down is easier. Great for corsets or for bridal gowns.